If you love GHOSTS, HAUNTINGS and HISTORY, my latest release The Ghosts of Cape May NEW HAUNTS / OLD GHOSTS should be haunting the nightstand next to your bed! In this new book, the fifth in the series, I will take you on a paranormal journey to twenty-five of my favorite haunts in Cape May, New Jersey… America’s oldest and most haunted seaside resort. Combining my psychic insight as a medium with the keen research abilities and knowledge of some of Cape May’s foremost historians, I was able to put many of the city’s oldest hauntings into perspective and shed light on why the dead are not at rest. The Ghosts of Cape May New Haunts / Old Ghosts emphasizes the human interest side of hauntings. During my investigations, I try to connect with the ghosts on a personal level. Behind every haunting is a ghost, and behind every ghost is a story. I write each investigation in such a way that the reader can truly empathize with the ghosts, and you will feel like you are along with me on each investigation. CAN YOU FEEL IT? Many say they are drawn to Cape May for explainable reasons. The dead seem to feel a particular pull to the old resort as well. Join Cape May’s Ghost Writer on 25 thrilling investigations of haunted hotels, inns, restaurants and more. In Cape May, you never know where you might find a ghost hiding. Best to be prepared. 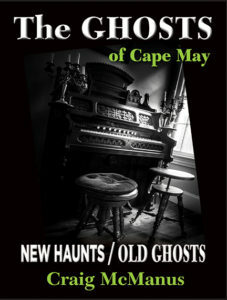 Grab your copy of The Ghosts of Cape May NEW HAUNTS / OLD GHOSTS today! Also available at haunted establishments throughout Cape May. My first four books are now out of print. You can still find The Ghosts of Cape May Books 1, 2 & 3 and 400 Years of the Ghosts of Cape May online from various sellers. More books to come!